The phrase “a clean slate” is kicked around a lot this time of year. People are encouraging others and themselves to forget the heartache or mistakes or tragedies of last year and begin anew. A clean slate. It sounds so crisp. So freeing. So beautiful. So…clean. But I’m beginning to wonder, is a clean slate actually possible? And even if it were, is it desirable? To start anew and forget last year, as if it never happened? I walk into 2015 dragging a heavy, messy, embarrassingly dirty slate behind me, and I think I’ve been under-appreciating it. Maybe you have been too. Think about it. On your messy slate from 2014 are all kinds of things, right? That time you lost it in the office and yelled at your boss. That time you sent a not-so-gracious email to someone and immediately regretted it. The relationship you held onto for far too long. This person you hurt. That person who hurt you. Too many drinks. Not enough exercise. Lying, cheating, stealing. Sin. Maybe this year’s slate is a little better than the last year’s, or maybe it’s astronomically worse. 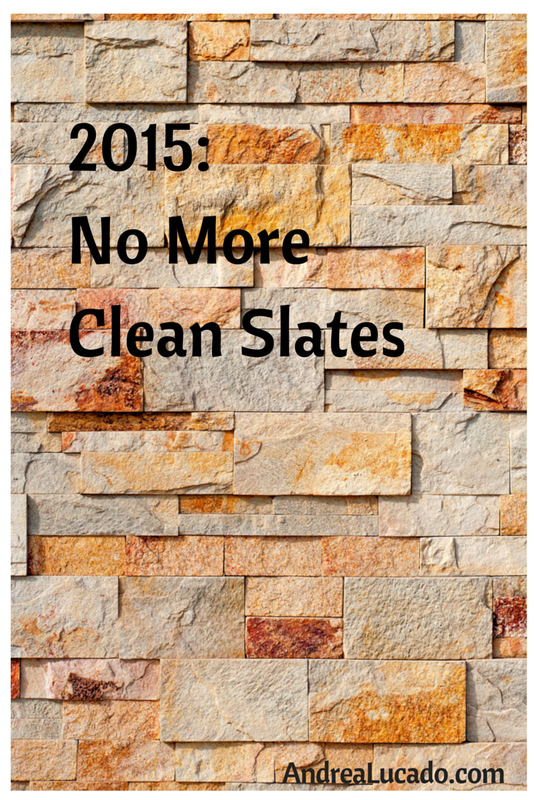 Either way, here’s my challenge for you: Don’t start with a clean slate in 2015. Don’t disregard your year’s failures and chalk it up as a mistake. It wasn’t. That’s how it is with our lives when we consider them through this annual, calendar-focused lens that we like so much (rather than viewing it as the long, extended journey that it is). The gross stuff, the things we messed up, the people we refused to forgive and the jobs we quit but shouldn’t have—all that stuff is getting us somewhere. All of it is on purpose. Your 2014—no matter how terrible—was not a mistake. I can promise you that. God did not forget to pluck you off the earth for a year, planning to put you back in 2015, because he knew how awful these twelve months would be. You, for whatever reason, were meant to live the year in the way that you lived it. Not beginning the year with a clean slate is not the same as dwelling on the past; it’s an acceptance of it. It’s understanding the value in not discarding the past year altogether because all the mess-ups and less-desirable things were getting you somewhere, to that good sentence. You just had to write all the crappy sentences first. In 2015, I will be made up of richer stuff because of the crap I pulled (and wrote) in 2014. I learned things the hard way. I cried. I felt that refining fire we always sing about, and I was reminded that God is near. That He is always, always near and He is ok with my messy, dirty, tattered, disgusting slate and that means I can be too. It’s getting me to the good stuff. If we clean the slate we are cleaning away the good with the bad. I for one, accept the lessons learned from my failures and value my successes. It’s okay to look in the rearview mirror on occasion. We just shouldn’t be staring in it while we are trying to move forward. Wonderful words, Andrea. May 2015 be a year of learning, growth, and prosperity, to all. This is very well said; and so helpful. Thank you. Clean slate is from God’s view. “You died with Christ, were resurrected with Christ and are seated with Christ”. He’s present to that reality and it is our role to allow God to move us toward that while remaining flawed, sinful folks.